Hire a bike from Yarra Valley Bike Hire and ride your way through the Iconic Yarra Valley wine region or 38km Warburton Rail Trail. $50 Gift Voucher Value will cover 1 Day Bike hire for 1 Hybrid Bike. Hire a bike from Yarra Valley Bike Hire and ride your way through the Iconic Yarra Valley wine region or 38km Warburton Rail Trail. $100 Gift Voucher Value will cover 1 Day Bike hire for 2 Hybrid Bikes. Or 2 Day Bike hire for 1 Bike. Hire a bike from Yarra Valley Bike Hire and ride your way through the Iconic Yarra Valley wine region or 38km Warburton Rail Trail. 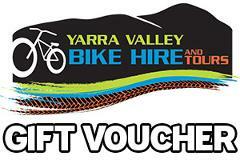 $70 Gift Voucher Value will cover 1 Day Bike hire for 1 Hardtail MTB Bike.